With over 5 million followers online and YouTube views in the millions, Grammy nominated producer Alesso already has a huge following thanks to his hugely popular sound and sold-out shows around the globe. His breakout track "Heroes (we could be)" featuring Tove Lo soared to over 310 million streams and Top 10 Airplay in the UK and US, amassing over 1.5 billion streams worldwide to date. His recent album FOREVER debuted as the #1 electronic album in the country on iTunes and he's currently headlining some of the biggest festivals around the world. Beginning his career five years ago as a self-taught 18 year-old bedroom producer in Stockholm, Sweden, Alessandro Lindblad's trajectory to the forefront of the global dancefloor is truly incredible. He began by tinkering with other people's songs, creating his own edits, adding piano riffs and melody ideas, and uploading his versions to Beatport. Alesso's efforts reached Swedish House Mafia's Sebastian Ingrosso, who swiftly took the teen under his wing, becoming his mentor, and signing him to his management and label. Alesso made an impressive entrance with the 'Taking It Back' remix of Avicii's 'Alcoholic', but it was his addition of a classic house drop to Nadia Ali's 'Pressure' that helped the single become one of the most played dance tracks of 2011. Swiftly unleashing a barrage of brilliant remixes for Swedish House Mafia, Devolution and LFMAO, the then teenager was named EDM Artist To Watch by MTV. In 2012, he teamed up with Ingrosso and OneRepublic's Ryan Tedder for 'Calling (Lose My Mind)', which went to No.1 on the Billboard Dance chart and has since been streamed over 63+ million times on Spotify. That same year, he was invited to open for Madonna on her MDMA tour, before releasing a volley of commercially and critically celebrated remixes including David Guetta 'Titanium', Keane's 'Silenced By The Night' and OneRepublic's 'If I Lose Myself'. Since then, he has played to sold-out crowds all over the world and landed a prestige Las Vegas residency at XS Nightclub with The Wynn. He headlined the Saraha tent at Coachella 2 years in a row, receiving the title 'Most Instagramed' artist for 2015 by Mashable. Being the trendsetter he is Alesso was the FIRST EVER musician to premier his music video for 'Tear The Roof Up' on snapchat receiving over 500,000 views in less than 30 minutes. This music producer has been able to make a flawless transition into the world of fashion by being the face of Carolina Herrera's '212 VIP' fragrance in 2015. This collaboration has opened the door for much more. Becoming one of the first electronic artists to create and premier a track for the gaming community on TWITCH 'Payday' debuted with Starbreeze and has plans for future collaborations. Next Alesso had a partnership with AXE which launched in February of 2016 in the Nordic Regions. He will also be a huge presence in Asia at the end of 2016. Being the world's largest electronic artist on LINE; Alesso has future collaborations with Jolin and EXO. Alesso has returned with a beautiful new love song titled "I Wanna Know" featuring platinum selling duo Nico & Vinz. It premiered on Zane Lowe's Beats 1 Thursday, March 31st and now solidifies Alesso as an undeniably skilled songwriter with over 32 million streams on Spotify and climbing. With a beautify shot video by top director Colin Tilley, it signifies a new chapter for him, shaped by his time in Los Angeles and his maneuvering through the joy and confusion of love. In the July 2016 Alesso donated the track to Stockholm Pride as they created one of the first ever #prideparades with the world famous video game Grand Theft Auto V.
Alesso closed 2016 with new single Take My Breath Away debut'd at his sold out show at the iconic Greek Theater, Los Angeles. The track signaled again a production in which he co-worte the topline on, adding a more sensual club sound, unafraid to stay away from the formula followed by so many. Following this with his stripped back single, Falling, (co-written by himself) again we hear the more sensual side of Alesso harkening back to his club roots. With a remix of The Chainsmokers & Coldplay's 'Something Just LIke This' as well as a slew of boundary-pushing singles soon to come, 2017 looks to be another unstoppable year for Alesso. Taught to play the piano as a young child, Alesso grew up on pop idols including Michael Jackson, before discovering Hip Hop via Nelly, Pharrell and Timbaland. But it was hearing his first House track as a young teenager that really opened Alesso's eyes to the possibilities and power of music. "We would go to underage parties when I was 13, 14 years-old," he remembers. "It was the cheesier end of Dance music, but I immediately gained a new perspective of what music is. I had never felt that kind of feeling - I still get it today - that rush and excitement. I want to be alive, explore the world, show love and spread love. House music makes me feel like nothing is impossible. I can conquer the world." He quickly immersed himself in as much House as he could find; a friend made him a mix CD and it was here that he discovered Daft Punk, Erick Morillo, Steve Angello, Daft Punk and Axwell. 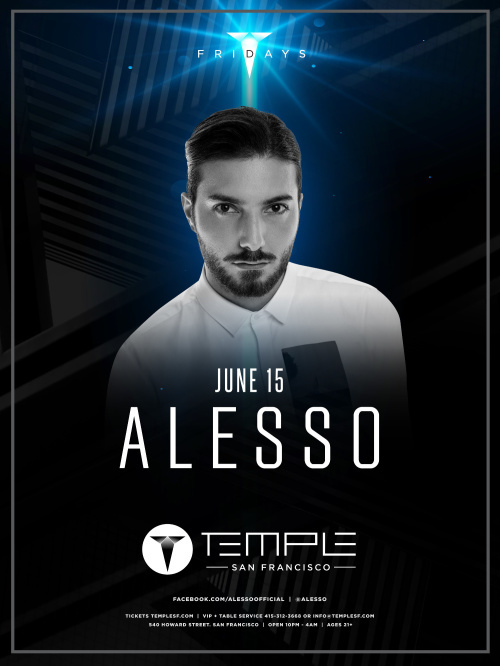 Throwing himself fully into making music at the age of 18, part of Alesso's success is down to his diverse influences and huge appetite for life which riddle his infectious creations with an energy that is palpable. Alesso's debut album proves the Swede won't be limited by genre or niche. There's soul, melody and adventure in his compositions; there's never merely one tempo or type of terrain. "Every song I make is House at its core, but because I've listened to so much Hip Hop, I think you hear an element of ruggedness in my music. I like to mix it up a little bit - not keep the same beat all the time. I'm not in any way making Hip Hop music, but I'm very influenced and interested in bringing different grooves into my songs. "I don't ever want to make just another club song," Alesso insists. "'Electronic music' sometimes feels like it's all about the money; I can say one hundred per cent that I didn't start doing this to make money. The main reason why I make music is to bring a message; I want to uplift people though music, I want to inject emotion into dance music. I want people to scream, jump, feel happiness. Explosive happiness. The best thing about music is it has no rules; I love the idea of breaking the rules."